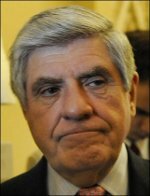 Anyone who’s been keeping abreast of the ongoing march to inflict ObamaCare upon the people of America has, by now, heard of Sen. Ben Nelson (D-NE). Sen. Nelson was the man that Senate Majority Leader Harry Reid bribed in order to get the needed 60th vote to pass the Liberals’ Health Insurance Reconstruction bill. What one might not realize is that Nebraskans are enraged at Sen. Nelson’s corruption, despite the fact that the Senator secured for Nebraska a perpetual exemption from paying into Medicare. It seems that the Americans living in Nebraska are more concerned with Right and Wrong than with lining their own pockets or having the taxpayers in the other 49 states paying their way for them. You may remember that Nebraska Senator Ben Nelson cast the decisive vote in favor of a government health care takeover after, of course, securing a bundle of money for his home state. There may be no consequences in D.C., but it’s good to see that the good folks in the Midwest know how to hold their representatives accountable. Nebraska Sen. Ben Nelson and his wife were leaving dinner at a new pizza joint near their home in Omaha one night last week when a patron began complaining about Nelson�s decisive vote in favor of the Senate�s health care bill. Other customers started booing. A woman yelled, �Get him the hell out of here!� And the Nelsons and their dining companions beat a hasty retreat. �It was definitely a scene in there,� said Tom Lewis, a 41-year-old dentist and registered Republican who witnessed the incident. A second witness confirmed the incident to POLITICO. It�s a new experience for Nelson. He used to be a popular figure back home, a Democrat who served eight years in the governor�s office and was elected twice to the Senate by a state that�s as red as the �N� on the University of Nebraska’s football helmets. But Nelson has seen his approval ratings tumble in the wake of his wavering over the historic health care bill, his deal-cutting with other Senate Democrats and, ultimately, his support to break a GOP filibuster and send the bill to a House-Senate conference committee. This is how it should be. Corrupt filth like Nelson and any who work with, live with, or support him should be harried and harrassed any time they show their faces in public. They should be – indeed, for the sake of America, they need to be – pilloried and publicly reviled each and every day until Nelson resigns his Senate seat and flees the state of Nebraska. In better times Nelson would have been covered in scalding tar, doused with feathers, strapped astride a fence rail, carried out of town, and told not to return under pain of death. If Nelson is not forced to resign, Nebraska and America will have to suffer with his access to power until 2012 when he finally comes up for reelection. His seat is unfortunately not one of those being contested in the 2010 midterm elections. But, on the growing bright side, the reaction of Americans in Nebraska to Nelson’s corruption and villainy is heartening. Keep it up, Cornhuskers! This entry was posted on Tuesday, January 19th, 2010 at 12:49 pm and is filed under Politics. You can leave a response, or trackback from your own site. I think the problem with our government today is that these politicians are not representing the people that election them. They are instead representing their own ideals, corporate bullies that fill their wallets. Senator Nelson failed the people he represents and that should never be the case regardless of being republican or democrat. These corporate lackies need to be brought to the front and have the public decide their fate. I think our government is a big joke now and its sad. Change what you said to “special interest lackeys” and I’d totally agree with you, Jobister. It’s not just, or even mainly anymore, the corporations buying politicians, not if the donations levels over that couple of decades is any indicator at least. By the way, very interesting piece. Strangely, this is the first I hear of this. Much as I said to Jobister, if you replace “corporate” with “special interest.” I agree with you. It’s odd – and a little saddening – that you’ve read the numbers on donations but still focus your vitriol solely on corporation. That implies that you’ve little or no problem with unions buying politicians. I keep making this mistake. I honestly don’t see a difference between Corporations or any other human collective. People need to support politicians individually rather than as a group. When groups are allowed to organize in any way other than a combination of individuals this is a problem.